At 12 months, your tiny baby has become a lively, inquisitive toddler. They're growing up quickly, they're learning about the world and they're very active! To support them in this important phase of their development, they need the best possible nutrition. As a parent concerned about food origin and healthy eating, you naturally want to give your toddler only the best. 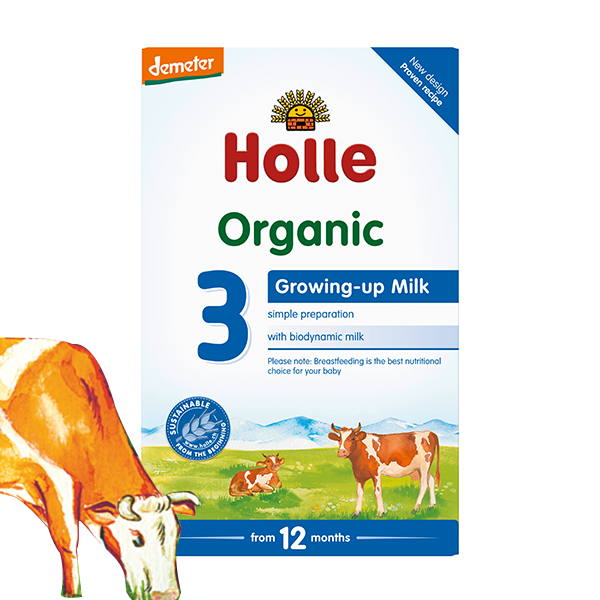 And Holle Organic Formula 3 Growing-up Milk is quite simply the healthiest, most natural formula growing-up milk you can buy - organic, free from additives and full of goodness. Holle Organic Formula 3 Baby Milk has got everything your toddler needs for strong growth and an active, healthy lifestyle. Holle Organic Infant Milk is produced from 99% organic ingredients plus vitamins and minerals (which are required by law). Holle only sources from local farms, so all the milk used comes from a trusted, known origin. Each farm raises its cows in a natural, caring environment where they are free to graze in organic fields cultivated according to modern biodynamic principles - in tune with nature and completely without chemicals. 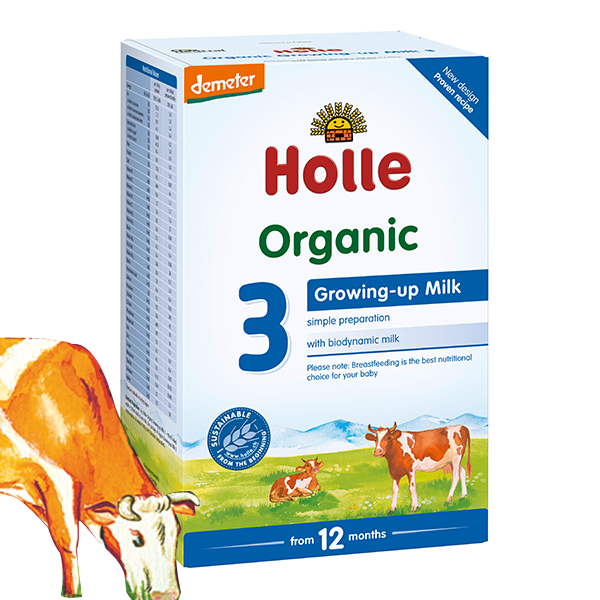 Because Holle Organic Growing-up Milk is made with such high-quality milk, its nutritional value is unbeatable. 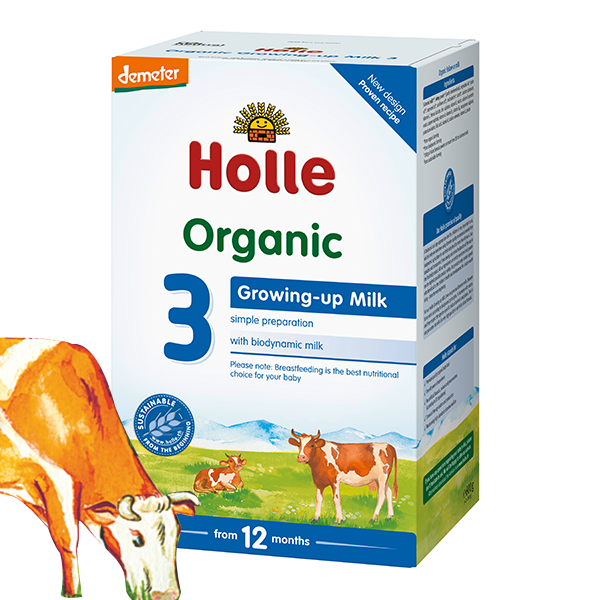 Holle Growing Up Milk is 100% free from gluten, wheat, soya and has no added sugar, fish oil and GM ingredients. For your baby's healthy development, none of the Holle baby milks have added fluoride. It's easy for your baby to digest - and it tastes great too! Energy: 484 kcal/100 g milk powder or 68 kcal per 100 ml prepared bottle. Organic, tasty, creamy - winner! My baby has been on Holle formula pretty much since birth as I could not breastfeed..And knowing that I am giving my child the best formula available took the guilt (peer pressure can be awful!) away. She loves formula 3, it mixes so well with water and have creamier consistency than 1 and 2. She is 1 now but still takes 4 bottles a day of formula. I dont mind at all as its packed with vitamins, minerals and other goodness. Thank you Holle and Ulula!! My one year old just loves it! As she's having milk in morning and before bed it helps her to boost herself for the day, and calms before bed! Very happy with my purchase. And great customer service. My 15 months old daughter absolutely loves this formula milk! She took to it right from the beginning, when I stopped breastfeeding her at 11 months. I have done so much research about formula milk and I am happy with Holle, totally organic, ecologic and just how formula milk should be. And great taste as well, as my daughter couldnt stay without a bottle each morning and each evening. Easy to prepare, transparent about ingredients, and also suitable for older children. My child is not quite 2.5 years old, and he still insists on a cup of formula before bedtime. I am a maternity nurse which is why I appear to have babies regularly - I do, but I don't give birth to them!! Holle was originally recommended to me by a client who wanted to use it for her baby - wanting as natural a baby milk as possible and I have recommended myself ever since - especially to those whose baby might be allergic. My little girl is drinking Holle formula since birth. At first I used it to top up breast milk intake and she had no problems switching between breast and formula in the same feed and I think that is partially because of the natural taste of Holle (yes I have tried it). She is 14 months now and growing well on it and one of the great things is that Holle mixes well with water at all temperatures. She is now on Holle 3 and enjoys it as much. I was devastated when I found out I wasn't able to breastfeed exclusively and had to feed my baby artificial chemically enriched formulas, but Holle's organic, additive-free origin gave me confidence and a peace of mind. My LG has been doing really well on Holle infant formulas since 4 months and is now 13 months & has progressed to the Holle growing up milk 12 months plus. I chose Ulula primarily as theirs were the only infant formulas I could find without added Fluoride. My LG is very mentally advanced for her age & as fIuoride has been scientifically proven to "dumb down" the nation I can't help but wonder if her fluoride free milk has contributed to her metal alertness! She has also enjoyed the 6+month cereals. Excellent products. Far superior to the high street formulas. Would recommend to anyone.